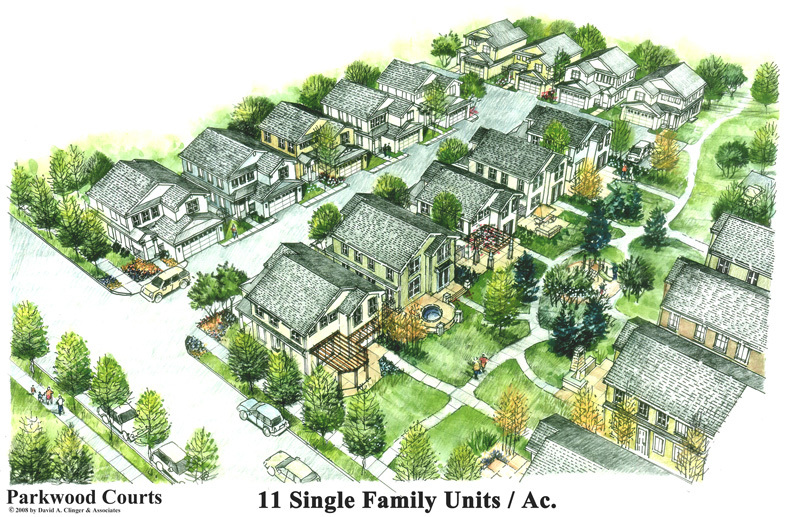 Parkwood Court Homes are really a neighborhood of detached townhouses, grouped around a T-shaped motor court. They face outward to a landscaped pedestrian greenbelt leading to a public street where visitors park on both sides. The motor court is strictly for residents. Parkwood Court lots are approximately 40 x 80 feet and the buildings are 30 feet wide with 10 feet of separation. As a result, this plan is extremely cost-efficient to develop. It separates cars from pedestrians. Use easements concentrate fenced outdoor living space within the side yards facing the adjacent blank wall. The two-story homes with two & three bedrooms range from 1350-1800 square feet. The landscaped courts provide pleasant pocket parks and walkways to the front doors of the homes and can meet requirements for on-site storm water detention.